You're either gonna love me or hate me for this idea.... It involves ink and paint. My two biggest enemies when it comes to crafting with my kids. The thought of my kids running around the apartment with ink and/or paint on their hands is a horrifying thought to me. Well, big milestone in my life happened last week when I overcame this fear, covered my dining room table with kraft paper and let my kids craft with paint. 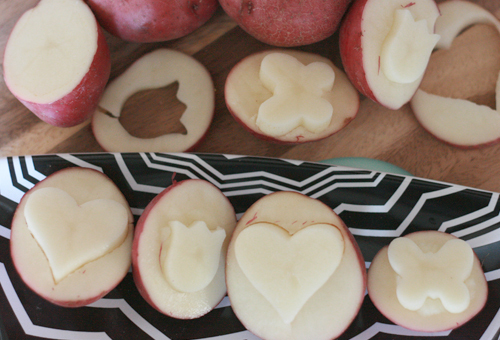 You're going to LOVE what we did here... We made homemade Valentine's Day crafts out of potatoes. That's right, potatoes. And it was SO easy! Here's what you need: 1 potato 1-2 small cookie cutters knife Paint and/or stamp pad Paper How to make your stamps: 1.) Cut the potato in half 2.) Stick the cookie cutter into the flat surface of the potato 3.) Cut 1/4" circle off the potato and peel the piece off around the cookie cutter while it is still stuck into the potato. 4.) Place the potatoes facing down on a paper towel and ensure they are super dry before you start to craft. I put a squeeze of paint on a paper plate and let the kids dip the potato stamps into it. They stamped pink construction paper to make homemade cards for everyone in our family. They wrote notes on each after they dried. They also used a pink stamp pad to mix things up a bit. If these directions are confusing in any way, just watch this video with Martha Stewart. Happy Crafting!